Well, kind of. 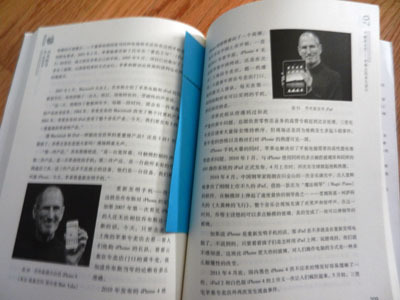 I can speak English and Mandarin natively, then French and Japanese and Spanish at an intermediate conversational level. I don’t really speak Romanian and Korean but included them anyway. Here’s something I’ve been working on recently: a Youtube channel of my guitar covers. I’ve been playing guitar for a few years now (I started in first year university) and I thought it would be fun to record myself playing my favorite songs. I’m going to upload more as I have time. Please subscribe! I just finished my first internship — since it’s my first ever “real” full-time job, I feel it’s a rite of passage of some sort. The internship, or co-op work term, lasted 4 months from January to April. My position was titled “Software Developer”, and the company I worked for was [redacted], a small startup in Kitchener. Like most students at Waterloo, I found my job through Jobmine. The process was intimidating at first: the whole slew of resumes, interviews, jobmine cycles, ranking systems, etc, were a lot to take in. But as I brushed up my resume and tentatively submitted a few cover letters, I began to relax a little. In the end, I applied to 25 jobs (the limit is 50 applications). Most of these were in the Kitchener-Waterloo area, mainly because I leased a house here and didn’t want to relocate. Out of these 25 positions, 5 of them were cancelled before the interview stage. Out of the 20 jobs remaining, I got interviewed for 10 of them. The interviews came and went, and in the end, 4 of the 10 companies that interviewed me gave me an offer. So I had the good fortune to take my pick between 4 jobs, any one of which I’d be happy working for. I ended up simply picking the job that looked the most interesting. Edit (May 2018): This section has been removed at the request of my employer. All in all, my first internship was a positive experience, as I learned a lot and worked with very smart people. I learned how to work my way around a large codebase, also got a taste of what a startup is like. I suppose the only downside was that there was almost no social activity. This sums up my co-op experience. Starting this week, I will be doing another 4 month study term (2B Computer Science) until August. Now there’s a reason this notation has survived this long — it’s good. 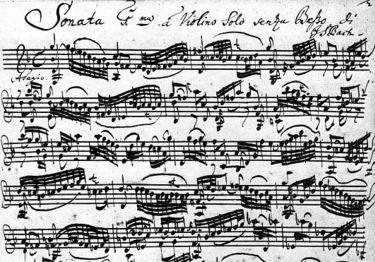 It’s easy to read, and allows a musician to read and play a piece he’s never heard before. But when you try to write music, you find that the notation is actually quite cumbersome to write. 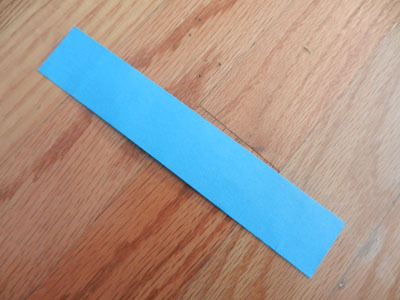 The notes are positioned on groups of 5 lines, so you’d better either have sheets of these lines printed, or be prepared to tediously draw these lines with a ruler. The timing of notes is very precise, so if you slightly exceed the allowed time for a bar, sorry, your notation is not valid anymore. To solve these frustrations, I created an alternate system of recording music, with the primary goal of being easy to write. 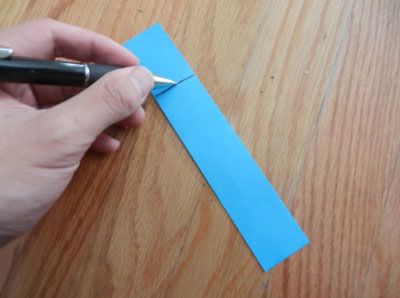 It’s possible to jot down a melody in 30 seconds, with just a pencil and normal (not printed sheet) paper. I do not claim my notation to be better than the standard notation. 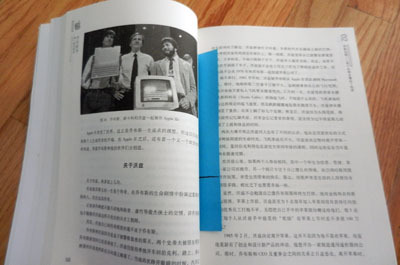 Rather, I achieve a different goal, sacrificing information for the ease of writing. Standard notation is good for recording a song so that a musician can play it without having heard it before. My notation is good for reminding a musician how to play a song he has heard before. A common use case would be reminding yourself the notes of a song you’re playing, or accompanying a recording of the song. In a way, its purpose is similar to that of guitar tablature. Here’s my justification for doing this. Most people can produce rhythm intuitively — that is, after hearing a passage a few times, he can clap back the rhythm. It’s much more difficult to find the correct notes after hearing the passage — I stumble upon it by trial and error. So if you write down the notes but leave out the rhythm, it would often be enough information to play the song. Start by writing the notes in a line, and separate bars with a vertical | line. Indicate the key signature at the beginning of the page, if needed. Feel free to liberally clump notes together or space them apart based on rhythm. Next is the rule for jumps. When the melody goes upwards by a perfect fourth or more (like from C->F), write the jumped note on an elevated line. Remain on the elevated line as long as the melody is still increasing or stays the same. But as soon as the melody descends, immediately drop back down to the neutral line. As long as the melody consists of small intervals (like C->E->C), we stay on the neutral line. Only when the jump is large (C->F) do we go to the elevated line. Typically in music, a large jump in one direction is followed by a small step backwards. This means that we spend most of our time on the neutral line. It’s very rare for a melody to have multiple jumps in the same direction. The melody does a large jump on the third note (C->G), so the third note (G) is on the elevated line. On the seventh note, the melody descends one note from A->G, so we immediately drop back to the neutral line. It does not matter that the same G was on the elevated line before. You might be wondering, why make this jump rule so complicated? Why have a jump rule at all? Well, we need some way of indicating octaves. Otherwise, a interval like C->F would be ambiguous: are we going up a perfect fourth, or going down a perfect fifth? On the other hand, if we decreased the jump threshold, say a major third (C->E) is a jump, then the melody would be littered with jumps up and down, which would be a nightmare to handle. Setting the threshold to the perfect fourth is a good balance. The complexities of the jump rule ensures that when you’re shifting upwards, the melody is actually going upwards. It would be confusing to the reader if there was a situation where we return from the elevated line down to the neutral line, while the melody is going upwards! Another distinct alternative to the jump rule is to divide all the notes into distinct octaves: for instance, put any notes between C4 (middle C) and C5 on the neutral line, everything between C5 and C6 on the elevated line, and so on. I experimented with this, but found it very awkward when the melody straddles on the boundary between two octaves. And that’s how the jump rule was created. So please experiment with this system, see if you like it! 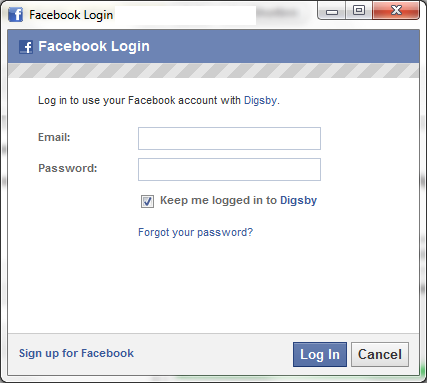 Then after you give it your credentials, Digsby still thinks you’re not logged in, and so on. 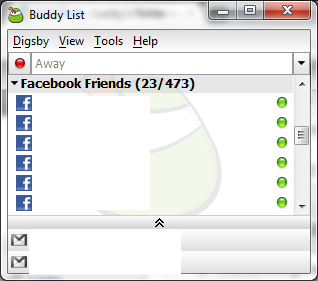 Go to Digsby -> My Accounts and in the Add Accounts section at the top, select the Jabber icon. 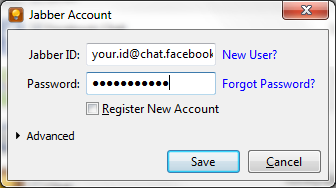 In the Jabber ID box, put your.id@chat.facebook.com, and in the password field, put your facebook password. For example, if your facebook page is at facebook.com/yourname, your Jabber id is yourname@chat.facebook.com. At this point, you’re done: Digsby should give you no more problems about Facebook. Warning: the following is unnecessary and experimental! It might screw up the entire Digsby installation, forcing you to reinstall!